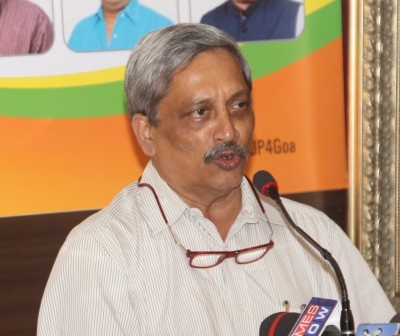 Panaji Sep 16 (IANS) With Goa Chief Minister Manohar Parrikar admitted to the All India Institute of Medical Sciences in Delhi a team of central BJP leaders is expected to arrive in Goa on Sunday to assess and recommend to the Centre a political roadmap for the BJP-led coalition government. Speaking to reporters state BJP president Vinay Tendulkar said the team led by BJP General Secretary Ram Lal was expected to arrive on Sunday afternoon. "He will arrive in the afternoon after he will meet senior party leaders and coalition partners to decide on the future course of action " Tendulkar said. While a section of senior BJP leaders feel that dissolution of the state Assembly and a mid-term poll is the way ahead instead of thrusting senior leaders at the helm of government some legislators believe that the government should continue at any cost. A proposal mooted in the presence of Parrikar on Friday to make coalition ally and Public Works Department Minister Sudin Dhavalikar of the Maharashtrawadi Gomantak Party a Deputy Chief Minister and an officiating CM has been shot down by another key ally Vijai Sardesai the Town and Country Planning Minister and Goa Forward President. Ram Lal will meet officials from the BJP allies as well as supporting Independent MLAs in a bid to forge a political strategy and finalise options for the post of Chief Minister before recommending the same to BJP President Amit Shah on Monday.